This joke has been told many times: a surgeon, physician and pathologist were out on a pheasant shooting trip. They noticed a particularly interesting bird flying in the air. The physician said "I wonder if that could be the rare lesser spotted pink crane. Perhaps it is a juvenile red collared duck. Do you think we are too far north for it to be a spotted hawk? " "There's only one way to find out" replied the surgeon. She aimed her gun and shot the bird dead, then gave it to the pathologist who made the diagnosis -- a pheasant. We always believe that the pathologists can provide us with the definitive answer. What I remember from pathology lectures at med school is being presented with picture after picture of pink shapes with a various number of black dots. Generally, the darker the slide, the worse the diagnosis. Have things changed since labs have become more automated? A couple of weeks ago, I invited myself to the pathology lab at Well Woman diagnostics and looked at how the estrogen receptor (ER) status is assessed. After the diagnosis of breast cancer is made, it is important to know the prognosis of the cancer and to predict how it will respond to the various treatment modalities available. One of the mainstays of breast cancer treatment is endocrine therapy (Tamoxifen, aromatase inhibitors and Goserelin). The higher the ER, the more likely endocrine therapy is to work. The process involves many steps of fixing and unfixing and is partially automated. Tissue can be taken from the tumour using a biopsy needle which gives a core of tissue. A representative part of the tumour must be biopsied. When the tumour is placed in formalin, the time must be written on the jar as the formalin MUST be fixed for at least 6 hours. The tissue is cut up and parts are imbedded in paraffin. Thin slices of tissue are sliced by hand and placed on a slide and then stained. This allows the basic diagnosis of to be made. Nahwahl Isaacs processing the tissue for ER testing. If there is a breast cancer, a representative portion of the tumour is then processed a second time and the ER receptors are tested. In order to do that, the "bridges" have to be opened up, a stain with an avidity for the receptor attached and another stain to show up the previous stain added. At the end of the day, the staining is quantified by the pathologist. Even in a first world lab, there are many steps involved and many possibilities for error to creep in. 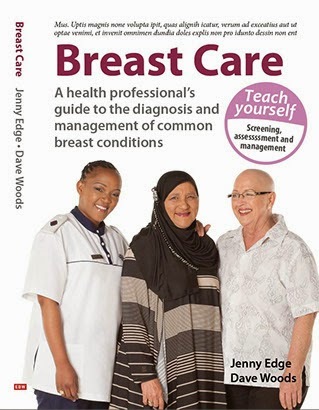 My last blog dealt with the issue of diagnosis and management of breast cancer in low income countries. I didn't deal with the paucity of reliable laboratory services in Southern African countries. In South Africa, we are lucky to have access to world class facilities. To get serious about improving breast cancer management in low income countries, access to reliable pathology services is as important as access to drugs. Many thanks to Nicole Morse and Judy Whittaker from Well Woman diagnostics for letting me spend time in their lab.